It's always exciting to receive your Birchbox at the start of every month with products that your can try out. 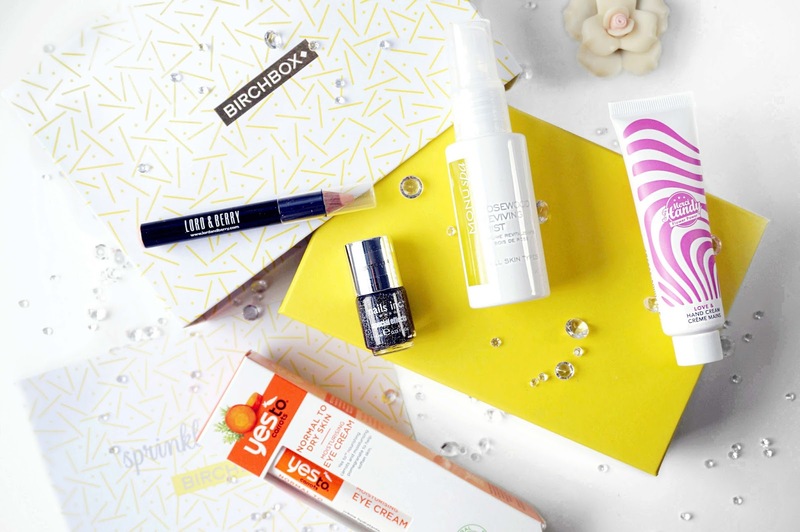 Birchbox is a subscription which cost's £12.99 a month including P+P based on your profile that you create. This month theme is 'Sprinkle Happiness'. Starting with packaging, I really like how they are changing up the boxes, I really like the pullout draw design not to mention the bright yellow packaging with gold accents which feels very spring and fresh. There are 5 products that I received in this month's box. The first item that caught my is the Yes To Carrots Moisturising Eye Cream which contains carrots and pomegranate, it has a nourishing formula and helps to moisturise the sensitive eye area. I'm really excited about this and have started to use it immediately, I have been looking at the Yes To range and I'm really happy to have received this to try out. The next item is a face mist by MONUSpa and it's the Rosewood Reviving Mist which is to freshen up your skin and can be used before and after makeup. This smells delightful with a slight floral scent, the only con is that it spits in your face and not spray. The next item is the Merci Handy Hand Cream in the scent Flower Power, I've used the Merci Handy hand sanitizer before as it smells delightful after it dries. Flower Power smells floral and almost like my hair shampoo which I don't know if it's a good or bad thing. This sinks into your skin quickly and does not leave a residue but I feel like you constantly need to reapply this. It also has little pink beads in which is quite funky. I received the Lord & Berry Conceal-It Crayon in the colour Beige. This is a creamy concealer in a pencil form which can be used to highlight as well. I find the colour a bit too orange for me but I can use it to counteract and dark spots I have on my skin. Lastly, I received the Nails Inc Polish in the shade, Disco Lane. This is a very festive shade, it's black with a lot of holographic glitters. I love the Nails Inc formula so I am excited to use this in the future. I hope you've enjoyed this post! If you not yet subscribed feel free to use my referral link here.